My iPhone 4 always comes to my rescue when, amongst a million other things, the last thing I want to do is drag along my digital Panasonic GF2 when going out to somewhere camera-worthy. Naturally, I was worried sick when my iPhones Camera Roll and Camera applications started to act out and strangely crash when launched. To make things worse, my photos and videos were no longer accessible as iTunes decided to not recognize them, and the space occupied was just known as ‘Other’. I know what you’re thinking; tried that, sadly it didn’t work. I did a restore and synced from my recent backup and that did not, however solve the issue. There was one last thing I could but did not want to do. I could do a fresh restore and setup as a new iPhone. Bless my stars! I at last discovered a way out that fixed the whole problem with no photographs or videos lost. It will likewise work to repair corrupt Camera Roll thumbnails. First and most importantly ensure you’ve completed a backup of your iPhone within iTunes and leave your iPhone plugged into your PC. I was running Microsoft Windows. Download, install and open iExplorer. Select your iPhone from the list and navigate to the “Phone Data” folder. 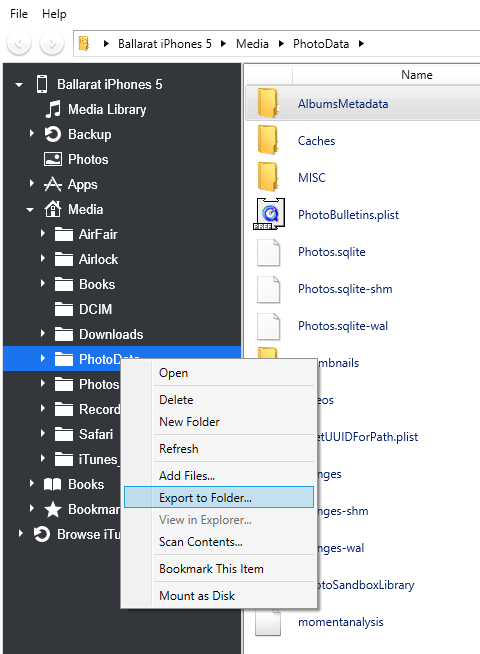 Right click on this folder and select “Export to Folder” and save it to your desktop to make things simple. Now that we’ve got a backup of the “Photo Data” folder lets get to work. Within the “Photo Data” folder look for any of the following three files and ‘right click’ and delete even though you will be advised otherwise, since you have them backed up already, show no mercy. 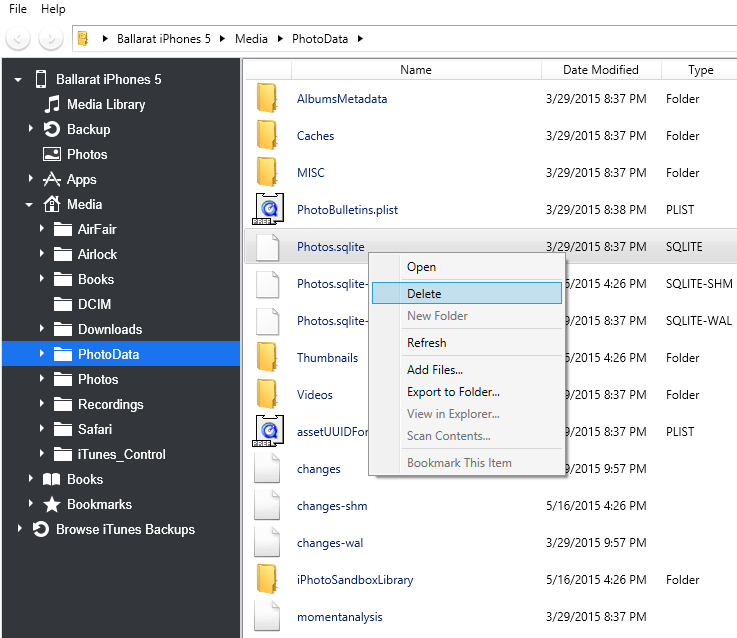 ‘Right click’ Photos.sqlite and select delete. I restarted my iPhone and viola! My Camera Roll actually launched, however no images were displayed. Don’t worry, all your images should and will take a couple of minutes to show, as the photo library will rebuild itself. This technique worked for me, and I was able to recover my photos without restoring my iPhone. In the event that you are running into Camera Roll crashes, I would prescribe taking the above mentioned steps before doing anything that you’ll regret. Have you ever experienced a similar Camera Roll crash/corruption crisis or anything even slightly related? What steps did you take to settle it? Fill us in as to whether this worked for you! PS – I have received so many emails expressing gratitude toward me for this arrangement and you have asked for a donation button so you can “buy me a beer”. You can do so below if you wish! Good day!